The province I call home is relatively catastrophe-free. Alberta is a land-locked northern city in Canada, not much is visited upon us by way of weather events, other than extreme, nostril-slamming cold and the occasional drought. However, when it hits, it hits big, like ‘Black Friday’ in 1987 when a tornado killed 27 people, or, two weeks ago, a devastating flood, which shut down a major city and most of southern Alberta for days, resulting in loss of life and several billion dollars worth of damage. Weather is unpredictable, and often deadly, but a good thunderstorm is a thing to behold. A thing many people, including myself, enjoy. A thing that would inspire any artist. Well, not just any artist. 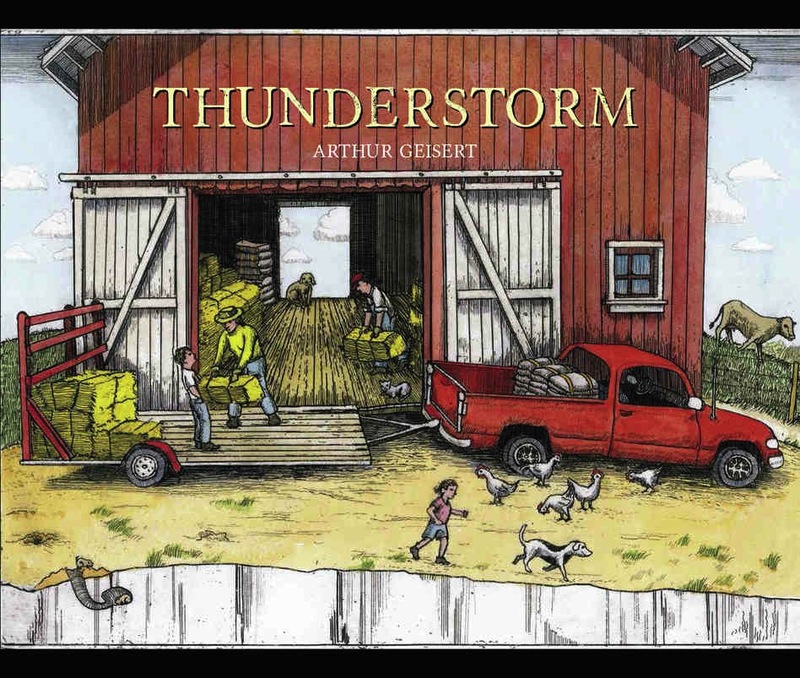 Thunderstorm by the great Arthur Geisert is exactly the kind of book I would have loved as a kid, with imagery that would’ve stayed with me into adulthood. It’s in the details; the stuff going on in the corners, the fragments of story waiting for a turn at centre stage. A mid-west farming community in the midst of a stormy afternoon, full of scattering animals, busy humans shuttering down their belongings, and a panoramic landscape wide open to whatever is thrown at it. And pigs. There are always pigs in Geisert’s picture books. But for the stated progression of time from 12:15 PM to 6:15 PM, Thunderstorm is a wordless book, and yet the visual narrative reads like a breaking news story, with snapshots of calm interspersed with chaos. Geisert repeatedly treats the viewer to cross-sections of trees, yards, and farmhouses (some intact, others in disrepair) as if say, life goes on, even when malevolent skies drive us indoors…or into burrows. The storm is ever present on the landscape, rumbling off in the distance or directly overhead. It is a storm told in line: straight, curled, horizontal or vertical, twisted into furious twirls as a tornado wreaks havoc on the land. Although Geisert has mastered everything from Aesop’s Fables to pig-laden ice floes, a weather ‘event’ such as this is a perfect vehicle for Geisert’s exquisite hand-coloured, copperplate etchings. What is a storm anyway, but one force imposing itself upon another? An artist’s hand, or the hand of nature. The collision of energy can be dramatic…and beautiful. On first reading, I thought Thunderstorm was the story of just one family in the red truck, delivering hay to various stops on a winding country road. 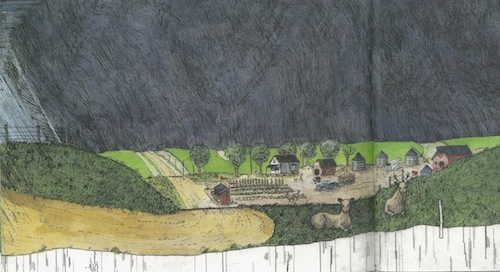 The more I looked, however, the more I realized that while the red truck is the through line in Thunderstorm, there is more than one story unfolding, including those of the scampering farm critters in varying stages of response to the weather in the foreground of the illustrations. What also revealed itself after several readings was the continuous flow of the artwork. In fact, the 34 copper plates create a single picture 40 feet long. 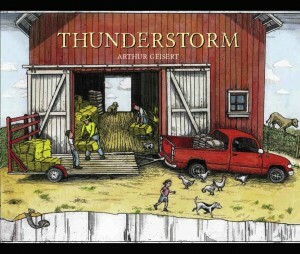 (Love to see Thunderstorm in its entirety, as a fold-out, or poster.) Frank Viva’s A Long Way Away is also a continuous piece of art, suggesting either a trend in illustration, or a newly discovered superpower-megaperipheral vision. In spite of the chaos, these prairie folk seem unfazed by the storm, calmly going about their business, stopping long enough to wait out the tornado under a culvert before heading off to help others rebuild in the aftermath of the storm. This generosity of spirit is something I’ve witnessed first hand in my own storm-ravaged province, and indeed, elsewhere in the world when catastrophe strikes. People want to help. A thunderstorm such as the one depicted in Geisert’s book is terrifying, but there is also a deep matter-of-factness to the event. Great tumult, but also great neighbourliness. And pigs. There are always pigs. Arthur Geisert has been etching beautiful lines, many of them porcine in nature, for more than 30 years. His work has been exhibited in museums across the land, including The Art Institute of Chicago. In 2010, Ice was selected as a Best Illustrated Book of the Year by the New York Times. It was the third time Geisert’s work has received such an honour. Mr Geisert grew up in Los Angeles and currently lives in a converted bank building in Bernard, Iowa.